Grubhub’s (NYSE: GRUB) stock is down 16% since the last earnings report. The primary reason for the downtrend is the scaled down Q4 outlook provided for adjusted EBITDA, which hasn’t gone down well with investors. The food delivery giant is set to report its Q4 results tomorrow before the bell amidst rising competition, spiraling expenses, and reducing margins. Investors would be eager to hear from the management about the strategies they have to grow on a sustainable basis despite the headwinds facing the industry. Last quarter, Grubhub projected Q4 revenues to be between $283 million and $293 million. On an adjusted basis, EBITDA was expected in the range of $40 million to $50 million, which was lower by $25 million compared to the past outlook provided by the firm. With competition heating up in the food delivery space, the company intends to spend more money to beef up its reach and marketing efforts to maintain its market share. For the third quarter, Grubhub reported stellar results surpassing street estimates. However, the stock took a beating when the company announced that it would be spending more money on marketing activities as it expands its presence. 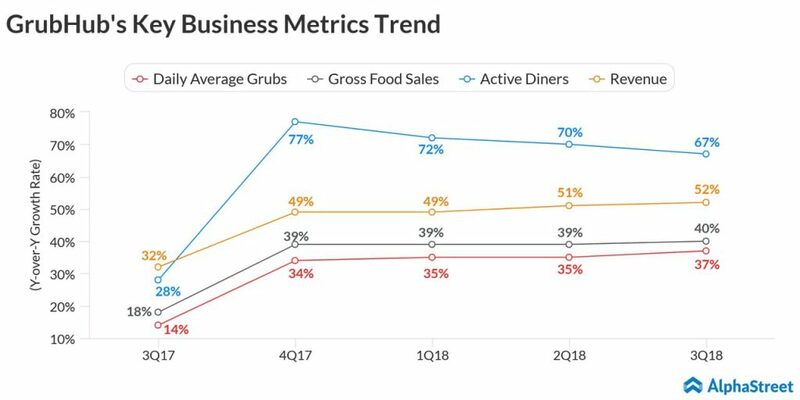 Apart from the headline numbers, investors would be looking at how active diners’ numbers are coming along. In addition, daily average grubs and food sales metrics would be closely tracked by the street. Apart from diner accounts, the company has been able to maintain growth on a year-over-year basis. It would be interesting to see whether Grubhub is able to improve its Q4 growth rate sequentially and over the prior year period. According to research firm Edison Trends, Grubhub is the market leader in the food delivery space with 34% market share as of July 2018. However, the report also added that the company has been steadily losing control to its rivals since January 2018. At the beginning of last year, it had a 41% revenue share of the total US market. The drop in market share has been a concern for investors. Grubhub is facing stiff competition from Uber Eats (UBER), DoorDash, Postmates and Square’s (SQ) Caviar. The company has been responding to its rivals historically by acquiring companies like Tapingo, LevelUp, Seamless, Yelp’s Eat24 and many smaller firms. It also entered into partnerships with restaurants and fast food chains like Yum! Brands (YUM) would bring more users onboard improving its average revenue per user. In the US, the company has also been foraying into new markets to broaden its delivery capabilities. Last quarter, it has entered 100 new markets earlier than the projected Q4 target bringing the total markets served to 180 for food delivery. With lower delivery fees and expanding the restaurants served on its platform, it would continue to give a tough fight to its rivals. Uber Eats has been mimicking the Grubhub’s strategy by expanding its market reach and inking partnerships with firms like McDonald’s (MCD) had helped to improve its market share in the US market. In order to defend its market share, the company is expected to spend on entering new markets, acquisitions and improving its delivery infrastructure. 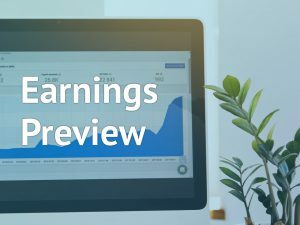 With nimble rivals, the expenses are going to continue in the near future which would pressure on margins. With changing food habits and consumer preferences, online food delivery market is going to grow in the US. Since the market potential is huge and with lower penetration Grubhub and its rivals have plenty of room for growth. The company needs to do a balancing act of tackling competition to maintain its market share, but also to have a check on expenses so that its fundamentals remain strong over the long-term.